Pretzel bread has become a foodie phenomenon in a very short period: not just the bun of choice at your favorite fast-food burger joint, but the go-to bread in any upscale restaurant. 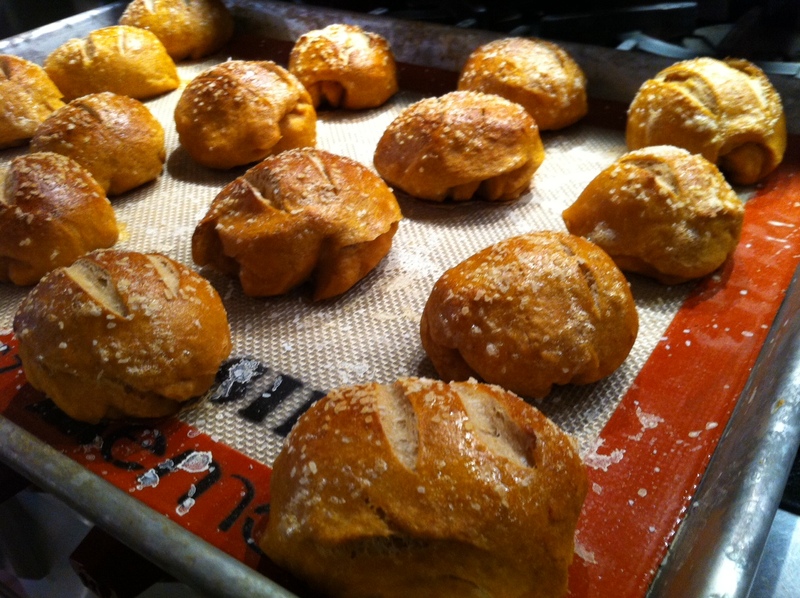 Making pretzel bread at home had one major stumbling block for me: the need for lye, which has nasty corrosive qualities that I don’t want to deal with in my kitchen. Even special baker’s lye was not an option. So when I found a pretzel bread recipe that used baking soda, a much milder and safer alkaline ingredient that I could simply pour down my drain after using, I knew it was time to bake. Combine the water, milk and butter in a glass container and microwave about 45 seconds to melt the butter and warm the milk. Set aside. I a mixing bowl, combine flour, brown sugar, yeast, salt and egg yolk. Slowly add the milk mixture and mix until the dough comes together. If it seems too dry, add small amounts of water. Knead the dough until it is smooth and springy, about 5 minutes. Place the dough in a bowl sprayed with cooking spray. Flip it over so all sides get oiled, and then wrap the bowl with plastic wrap. Place in a warm place until the dough has doubled in size, about an hour. Turn out risen dough on a floured surface and divide into equal pieces. You can make 15 small slider-sized buns, 8 burger buns, 8 hot dog buns or any other shape you like. Once all the pieces have been rolled, cover them with a clean dish towel and set aside to rest. While the dough is resting heat about 12 cups of water in a large pot. When it comes to a gentle boil, carefully pour the baking soda into it. It will foam and bubble vigorously. Add the rested pieces of dough to the simmering water and poach them for about 30 seconds and then flipping them over for another 30 seconds. You may need to do this in batches. With a slotted spoon or spatula, lift the poached buns onto a Silpat baking sheet (or a baking sheet sprayed with oil, then sprinkled with cornmeal.) Froth egg white with a fork, then brush each bun with egg white. Using a sharp knife, make a few slits on the top of the buns, about ¼-inch deep. Sprinkle with Kosher salt, then bake for 20 minutes until golden brown.